WHERE ARE THOSE BOYS IN GREEN? Soldier Soldier planting tree seedlings in Montana. HR 2066 is sponsored by a progressive US Representative, Ms Marcy Kaptur of Toledo and calls for the re-establish of the United States Civilian Conservation Corps (CCC) that will give the president the authority to order our government to invest in our most valuable human and natural resource capital. The CCC was one of FDR's 15 major initiatives of the New Deal passed in his first 100 days of office in March thru June 1933 that has never been equaled in passage since by any USPOTUS! Let's give CONGRESS ACTION to bring back this program to invest in our youth and energized the Nation in saving Mother Nature! 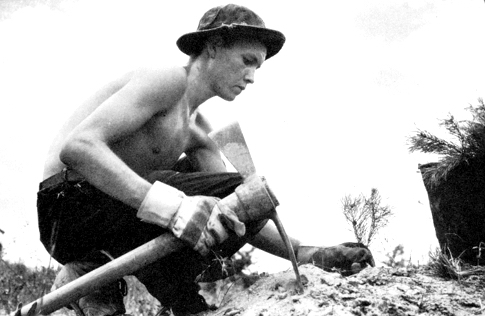 If given the chance, the CCC would be a real alternative National Service annually providing employment for more than 300,000 citizens of military age and older Native Americans and Veterans to perform needed work on our environment, natural infrastructure and also be first responders in disaster relief. Candidates running for federal office in 2016 should take HR 2066 on their platforms! its fellow men and women who try to maintain themselves, but cannot.